Our interview with Terry Syrek is a revealing conversation about an elite player learning to live with a condition that severely affects his playing. Terry is not only an incredible shredder, but a vocalist, producer, writer, and instructor. 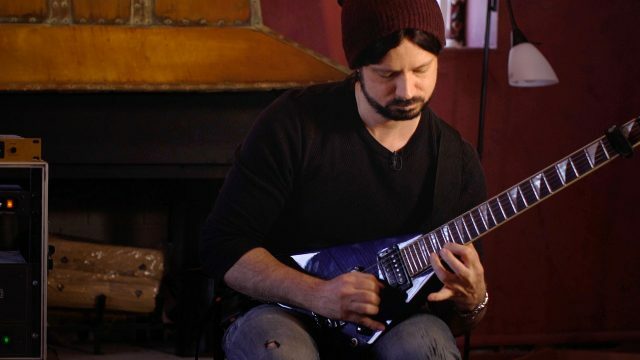 He’s been recording and releasing music for decades, and has performed alongside such legends as Steve Vai, Marty Friedman, Paul Gilbert, John Petrucci, and Zakk Wylde. He studied at Berklee, and has over 20 years of teaching experience. He also has focal dystonia, a neurological movement disorder that affects the motor control of his fingers and limits what he can play. It’s not well understood, and there’s no magic bullet treatment. Terry visited a number of experts to try to figure out what was going on, and his diagnosis was just the start of learning to live with a new reality. While it’s altered his relationship to playing the guitar, this condition hasn’t entirely quelled Terry’s virtuoisic chops, and it certainly hasn’t dampened his musical creativity! In this interview, we learn how Terry found ways to continue to write innovative prog guitar excursions despite his dystonia. The conversation ranges from Terry’s time studying at Berklee, and the rigors of professionally competitive practice schedules at a top-tier music school, to his journey of self-discovery and healing after being diagnosed with this condition.